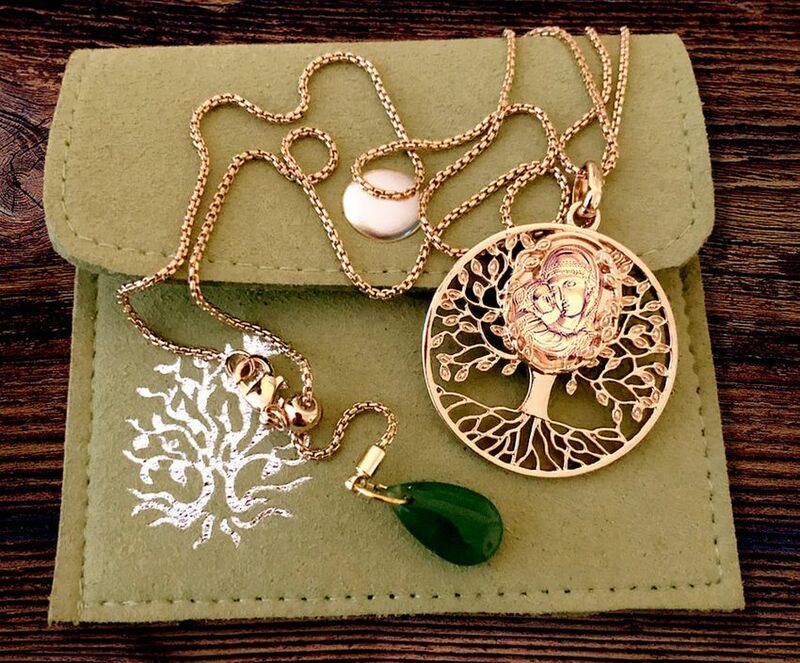 Madonna and Child "Tree of Life" Brass Pendant. An elegant image of life, joy, and healing, this pendant is based on the timeless symbol of the Tree of Life which stood in Paradise (Genesis 2:9). The addition of the Madonna and Child symbolizes how God fulfilled this promise in Jesus, "for the healing of the nations" (Revelation 22:2). The Blessed Virgin herself is the Tree of Life from which the fruit of salvation and new life came forth. Made of Brass. Set includes adjustable chain 16 to 22 inch. Chain is easily adjustable by moving the ball part by the clasp. The tree of life meaning symbolizes many nurturing aspect of life, powers of Mother Earth. The Universal symbolism was found in many spiritual traditions around the world. It symbolizes life itself, with it's branches reaching for the heavens "Father Sky" and it's roots, linking to "Mother Earth". The Tree has become a symbol of Love, Wisdom, Re-Birth, Growth, Strength, Redemption, Friendship, Bounty, Encouragement, Good Health, Bright Future, Positive Energy, Fertility, Immortality and a fresh start on life.